On a mid-summer’s afternoon on Infantry Road in Bangalore on Wednesday, a young girl envies the easy ride her dog gets in the arms of her mother. This entry was posted in Kannada & Karnataka, Life Etcetera, Mysore-Bangalore and tagged Churumuri, Karnataka Photo News, KPN, Sans Serif. Bookmark the permalink. ← Whose Global Investors’ Meet is it anyway? Maybe the dog is injured and they are taking it to a doc? nevertheless, lovely pic. The dog seems to be enjoying the ride. i want to be a dog in my next life! You can find same photo in Vijaya Karnataka, Udayavani and Kannada Prabha. My colleague Sudhakar Jain has captured eight frames in 10 meters. Certainly, background will be changed. Let’s congratulate Jain for getting a very good off-beat, human interest picture. the title is awesome ! I own a dog and i sometimes carried it cause it used to break the leash and runs away. Only Veterinary Doctor and Animal care takers can understand the situation . It is just Humane. KPN (KARNATAKA PHOTO NEWS) does not photoshop images or post photoshopped images as a policy. Unfortunately after this digital innovation people’s eyes have become yallow colored. Very sad. It is better to learn the lens and its properties. What a stupid thing have you written? 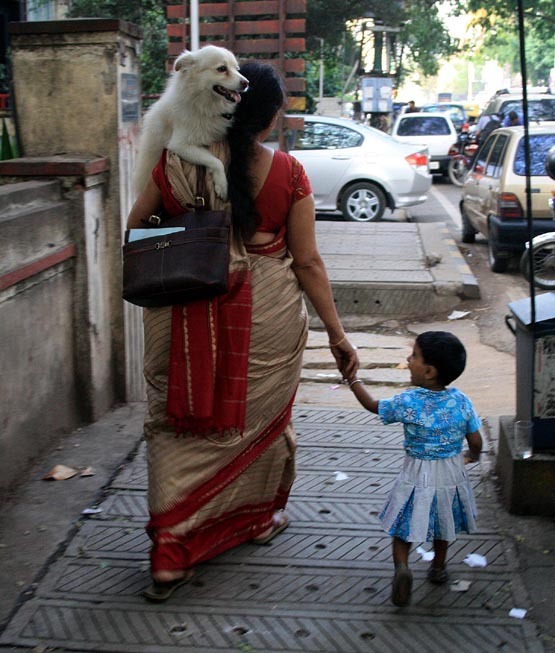 What does culture has to do with the woman carrying a dog and a kid walking on the road? I think that simply because you hate animals or you hate dogs that you have passed a stupid comment. I and many of my friends loved the picture. Dogs and other pets have showed their love towards us and in some cases I had seen they had given their lives to protect their masters, now what is the big deal if the woman is carrying the poor dog in her arms? Are you jealous Mr. Arun that you don’t have any pets to take care to or to love you? Are you a lonely fellow? Listen Mahatma Gandhi himself said that “A nation is known by the way it treats the animals” And Baapuji rightly said so. And so, I say that please don’t mixture culture etc. with this. Don’t talk like a politician. If Mr. Arun you can’t appreciate what the woman is doing then better shut your mouth.